PLEASE NOTE: This is historical information as the railroad has been torn down and no longer exists. 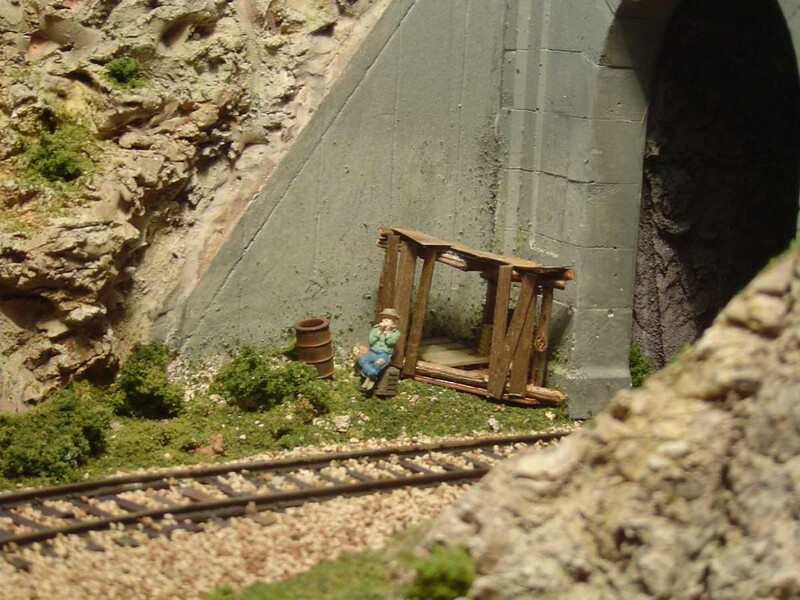 The mountain area is the major scenery focal point of the layout and is 7-1/2 ft high, 6 ft deep at the base and 14 ft wide. Many forced perspective techniques are used in the area with N scale and Z scale structures to fool the eye. The trestle is by JL Innovative Products and took about 50 hours to complete. It spans the waterfall area that flows into a lake. The hobo shack was my first scratchbuilt structure made out of twigs from my back yard along with scrape lumber from the trestle. It just outside the high tunnel entrance. The trailer scene is N scale along with the highway portal. The trailer features interior lighting along with a pole mounted light. The mountain in the background is one of the first thing you see when entering the room. Thank you! 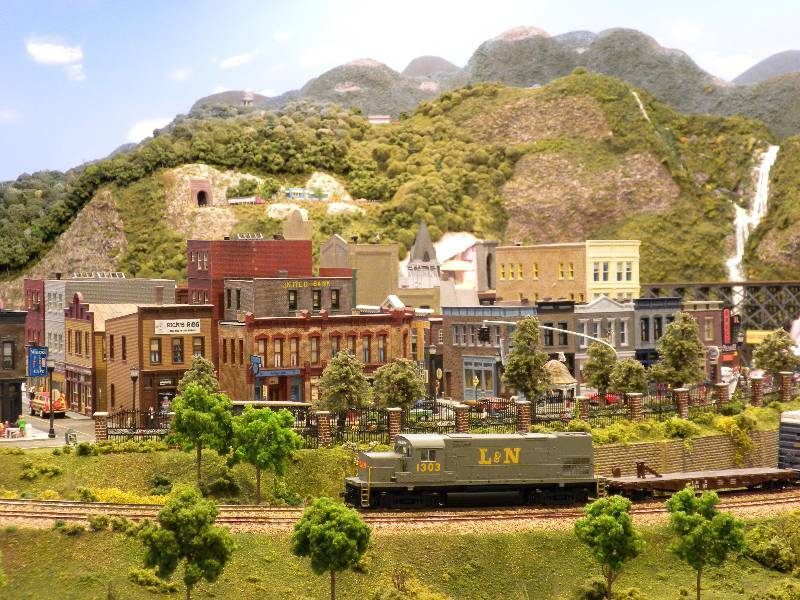 Can an Eastern US model railroad have too many trees? I’m currently working on extending the mountain area on the left side to complete it. How were you able to create the grey foliage near the hill tops in the background? It’s a great effect and really gives the illusion that the mountain top is much further away than it really is. Fantastic!!! RE: The foliage near the hill tops. They were created with pieces of 3/4″ insulation foam. I cut them to shape, sprayed them with spray adhesive, and sprinkled them with ground foam. Once they were hot glued in place I sprayed the area lightly with blue-gray spray paint. 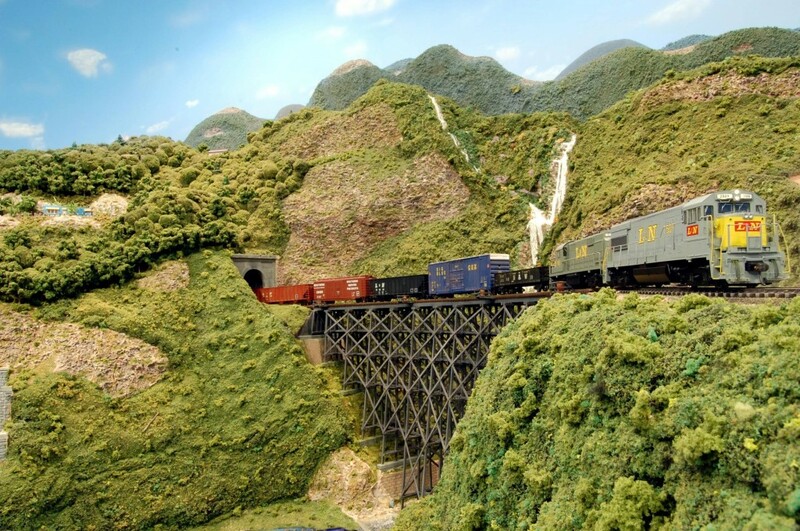 I got the idea out of an article in Model Railroader magazine, but I can’t remember which issue. Thank you for your kind words!